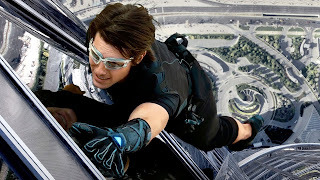 A spectacular spy action film, Mission: Impossible - Ghost Protocol is an expertly crafted thriller with terrific set-pieces and breathless yet controlled pacing. Agent Hanaway of the Impossible Missions Force (IMF) is killed by assassin Sabine Moreau (Léa Seydoux) in Budapest while on a mission to retrieve Russian nuclear missile launch codes. Agent Ethan Hunt (Tom Cruise) is rescued from a Russian prison by agents Benji Dunn (Simon Pegg) and Jane Carter (Paula Patton), and immediately sent on a mission to infiltrate the Kremlin in search of records belonging to a man known as Cobalt, intent on initiating a global nuclear war. The mission goes wrong, the Kremlin is destroyed and Hunt's team is blamed. The IMF is shut down but the Secretary (Tom Wilkinson, uncredited) surreptitiously gives Hunt instructions to stop Cobalt, but with no back-up resources. Cobalt is revealed to be Kurt Hendricks (Michael Nyqvist), a mad scientist who believes world peace can be achieved after a nuclear holocaust. Hunt, Dunn, and Carter are joined by analyst William Brandt (Jeremy Renner) and head out to Dubai, where Moreau is planning a meeting to sell the nuclear launch codes to Hendricks. 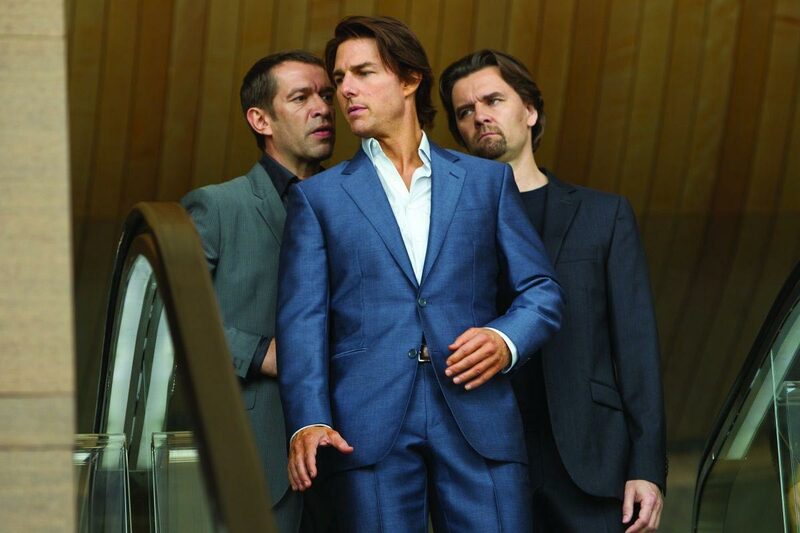 Directed by Brad Bird, Ghost Protocol is the fourth installment in the Mission:Impossible franchise. The film gets everything right: a good and always coherent story drives the action, the main characters are well-defined and each gets an opportunity to shine, and the right doses of sly humour pepper the proceedings. The action scenes are exquisitely crafted, the stunts are innovative and genuinely thrilling, and finally, the editing is sublime. Editor Paul Hirsch finds the sweet spot where the scene composition conveys risk and excitement without resorting to jerkiness, micro-edits or losing the stunt context. A large part of the Ghost Protocol charm resides in Hunt's team often screwing up. Many of the ruses that they try do not quite work, forcing the team to innovate to Plan B, and sometimes Plan C, on the fly. These are protagonists prone to failures, sometimes overestimating their own trickery, and having to rely on quick thinking to rescue each subsequent situation. Many of the set-pieces are nothing short of magnificent. Hunt and Dunn infiltrate the Kremlin with the help of an unwieldy on-the-fly virtual reality screen to simulate an empty hallway. Hunt (with Cruise doing his own stunt work) has to climb on the outside of Burj Khalifa in Dubai, using unreliable sticky gloves. And as if the climb up was not challenging enough, the return down is even trickier, this time without the gloves. The deception in the Dubai hotel rooms, where Hunt's team attempts to smoothly disrupt the transaction between Moreau and Hendricks, contains wonderfully staged suspense. The venerable car chase finds new life within a raging sandstorm. And the climax occurs at an automated multi-level parkade in Mumbai, a vertical and uncooperative jigsaw puzzle. The film is elegantly paced. Quiet scenes intermingle with frantic chases, and room is created for the team to regroup at regular intervals. Special effects are used strategically, and most of the film offers a grounded, realistic aesthetic. The slower-paced but still tension-filled interludes include an elegant cocktail party in Mumbai and a couple of heist-style break-ins. Amidst all the action, the script (by Josh Appelbaum and André Nemec) finds time to add to the backstories of the main characters. Carter has her personal reasons for going after Moreau; Brandt has a painful history with IMF which will take time to emerge, and Hunt himself has an elaborate background plan churning away, barely perceptible underneath the main plot. Fun, gripping and wildly entertaining, Mission: Impossible - Ghost Protocol strides to the pinnacle of the action spy movie genre.